In late July I drove down to North Carolina to visit the University of North Carolina at Chapel Hill. Ever since I moved to Virginia a year ago, I have been committed to visiting more Southern colleges and universities, and for years I have heard about the beauty of UNC’s campus so I definitely wanted to check it out. My wife and I turned it into an overnight trip, staying at the lovely Siena Hotel, and braving the triple digit temperatures to check out the dining options on Franklin Street (the main drag in town). We had great sandwiches at Al’s Burger Shack followed by delicious dessert at Mama Dip’s, in case you want to follow our footsteps. We really enjoyed the town, and the university is almost as gorgeous as advertised, but unfortunately the info session and tour were the worst I have ever experienced. 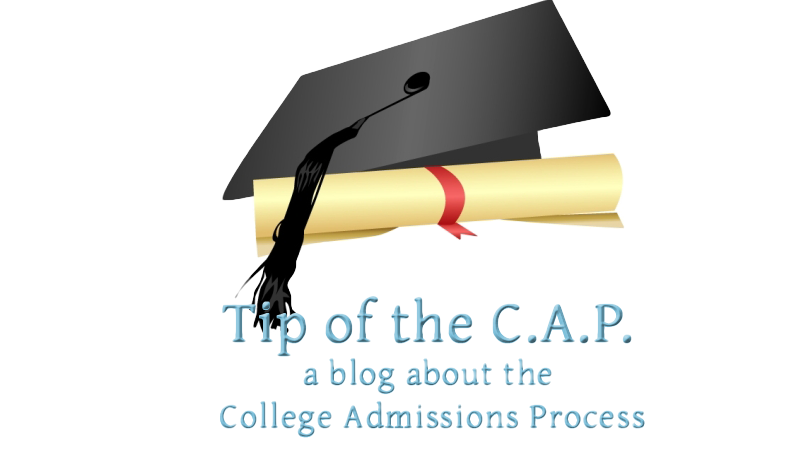 I’ve been to scores of colleges over the years (the few I’ve described on this blog only scratch the surface) and I’ve never been more disappointed or baffled by the complete lack of consideration for potential students and their families. 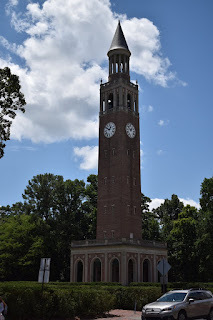 This doesn’t mean that I don’t like UNC–on the contrary, it is a really great choice for North Carolinians, and very attractive to out of state students who recognize how hard it is to gain admission. But I think that any potential visitor to UNC needs to do a lot of research prior to going on the tour, because it is unlikely that the tour will answer your questions. A little over 18,000 undergraduates (approximately 58% men/ 42% women). UNC accepted about 9,500 of their 36,000 applicants to fill a first-year class of 4,000 for an overall acceptance rate of around 25%. But UNC policy dictates that 82% of students must come from North Carolina, so the remaining 18% come from 44 states and 20 countries; obviously the admission rate for those students is much lower than the overall number. Over 75 majors and minors in 60 departments for undergraduates; 113 Master’s and 68 Doctoral programs. NCAA Division I; 28 varsity teams (15 women’s, 13 men’s); numerous club and intramural sports. Over 800 clubs and organizations on campus. 58 fraternities and sororities (30 with housing); about 36% of the campus participates in Greek life. On campus housing is required for all first year students. Chapel Hill is a wonderful college town with excellent shops and restaurants and is only a short walk away. Tuition, room & board and fees total just about $19,500 for North Carolinians, and about $44,500 for non-residents. Parents need to fill out the FAFSA (Free Application for Federal Student Aid) and the CSS PROFILE. UNC tries to meet 100% of student need, and their Carolina Covenant guarantees that students from in-state families earning below 200% of the poverty line will graduate debt free. UNC has Early Action as well as Regular Decision options. The EA deadline is October 15, and the RD deadline is January 15. Students use the Common App.There is an $80 application fee. Students must send official scores for the SAT or ACT. Mid 50% of the old SAT was 1790-2090 (CR+M+W) and 27-32 for the ACT. The University of North Carolina’s flagship campus is located in Chapel Hill, which is in the center of the state and forms part of the “Research Triangle” along with Raleigh, Durham, Cary and other locations. The Research Triangle area is one of the more economically prosperous parts of the state and is also home to Duke University and quite a few additional higher ed options. The metro area is home to over 2 million people, but Chapel Hill is a small city of approximately 54,000. The University of North Carolina is the oldest public university in America; it was chartered in 1789 and opened for classes in 1795. It is now an R1 Research Institution, which is shorthand for saying that there is pretty much nothing a student can’t study at UNC; it also means that professors do cutting edge work in every field–in fact, Prof. Aziz Sancar won a Nobel Prize in 2015. The campus is on over 700 acres and features handsome brick architecture and countless mature trees that provided much needed shade for my summer visit, and must provide gorgeous autumnal color. The large campus is doubtless a boon for students, but it was one of the factors making the visit so difficult and unsatisfactory. 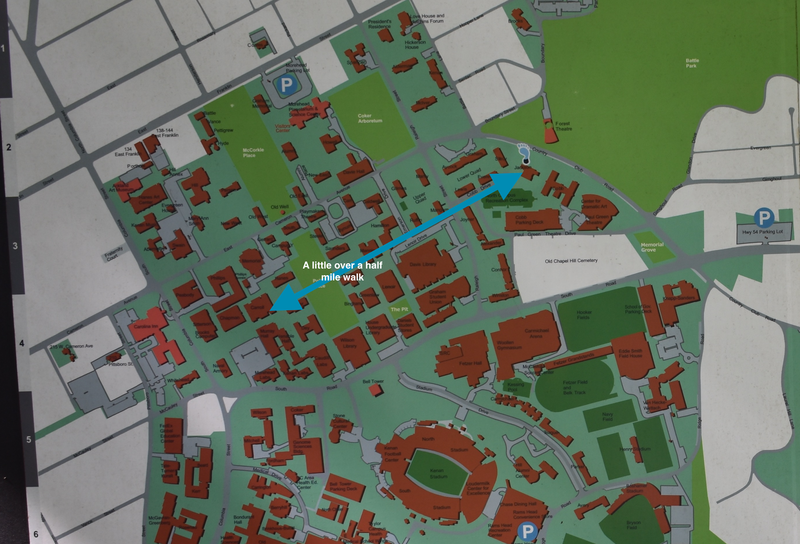 Visitors are asked to come to the admission office (located at the right arrow point on the blue line on the map); when asked about parking, one is told that there is parking outside the office. That’s true, but there are only a few metered spaces. Once ensconced in the admission office waiting room (which holds about 50) someone comes to walk the group to Carroll Hall, the actual building where the info session takes place (something not told to visitors prior to arrival). Unfortunately, as the blue line in the map at right demonstrates, the buildings are pretty far apart (my iPhone pedometer said nearly 3/4 mile) and Carroll Hall is an uphill trek most of the way. When I was growing up my father was disabled, and so I always pay attention to how colleges accommodate people who have difficulty walking. In many cases it is hard to avoid having visitors trek all over campus, but this was ridiculous. 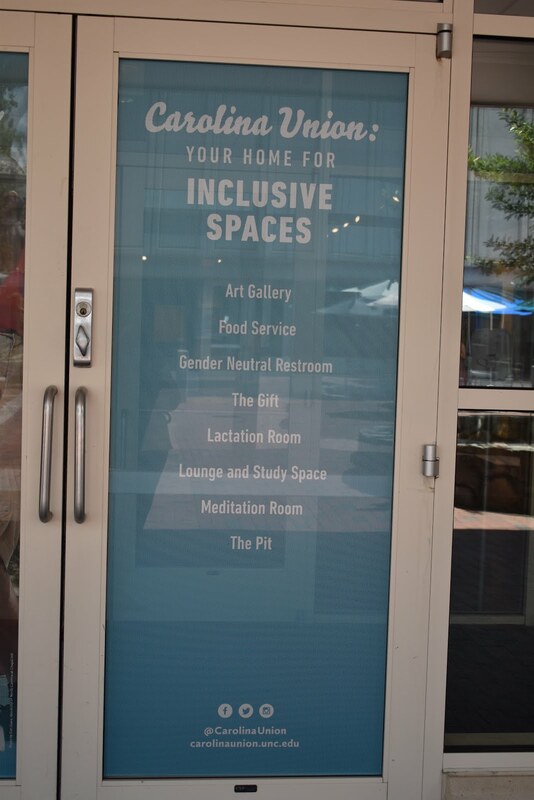 There was no excuse to make the nearly 350 people visiting start at the admission office if the info session was in Carroll Hall–UNC should have simply asked people to report to Carroll. I have since spoken with other people who had similar experiences at UNC, which makes me think this is standard operating procedure for them. If you or a member of your party have difficulty walking, save yourself some pain and go straight to Carroll Hall. The admission office had very little materials to pick up and they do not give interviews, so I can’t see a good reason to stop there (except to check in and demonstrate interest of course, but that could be accomplished by speaking with the officer giving the information session). 78% of classes have fewer than 40 students and large classes have recitation sections (led by teaching assistants) of no more than 25. As at any large college, it is a good idea for first year students to go out of their way to get to know their professors to make a good impression on them. As far as out of classroom education, the university touts the incredible 30,000 internship opportunities published on campus every year as a selling point, and there is no doubt that the Research Triangle location must help with this. We were told that 60% of students do independent research, which is a pretty respectable figure for a large state university. 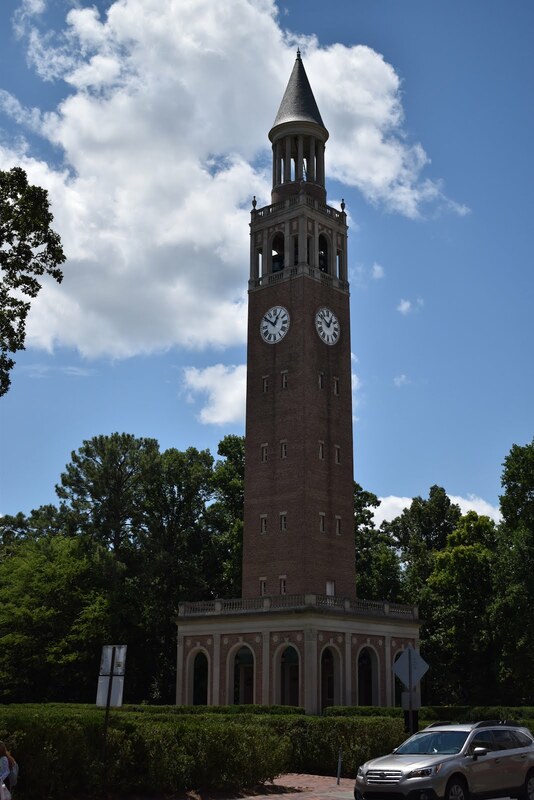 Unfortunately, neither the info session nor the tour that followed made any effort to describe any appreciable reasons why students should come to UNC, nor what might set UNC apart from other options they are considering. As I noted above, unless you already know a lot about the place, it is likely that you will leave your visit to UNC still wondering just what makes it special. I mean, there was no mention of campus life, no mention of the shops and restaurants in Chapel Hill, and no real attempt to dazzle us with successful academic or athletic programs. Inexplicable! UNC has 28 varsity sports all of which compete at the NCAA Division I level. Many sports have been quite successful recently, such as men’s basketball and lacrosse; in fact, one of my former students played women’s field hockey at UNC and is currently on the US Olympic team. Sports seem to be a source of civic pride; it was great walking downtown in Chapel Hill and seeing how many shops and restaurants prominently featured posters supporting Carolina sports teams, including relatively obscure ones like track and field, women’s tennis, and swimming. For students who want to continue competing in sports but who are not Division I material, the university offers lots of club and intramural opportunities. For a student who has played varsity sports in high school, club sports can provide a great chance to continue to improve at a sport and to represent their school. 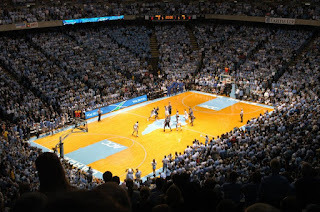 UNC’s website shows that there are a wealth of club sports for Tar Heels to play, including baseball, softball, basketball, football, field hockey, ice hockey, soccer, and volleyball as well as others which are less common at the high school level, such as team handball, ultimate frisbee, and sailing. The tour I was on did not show us any dormitories, though we were encouraged to look for a video of a sample room online; I found this one on YouTube. First year students under age 21 are required to live on campus. Other than that, we were not given any useful information. I did see a municipal bus system that seemed to go through the campus, so it is likely that students do not need to have a car to be able to get around the Chapel Hill area. The campus seemed very well lit, and there were security call boxes all over. Interestingly, in the Classics building classroom we were shown there were posters advising what to do in case of an active shooter on display, as well as automatic blinds, which could come in handy during a lock-down. The center of campus appears to be “the Pit”, which houses the student center, the dining hall (decorated with a poster showing it has been in the USA Today top 25), the bookstore and a brick plaza. Campus lore holds that if a person stands in the Pit for 24 hours she will see every undergraduate at UNC! Unfortunately the tour continued to disappoint by telling, but not showing the facilities and features near the pit. The dining hall was understandably closed for my summertime visit, but we were not taken to the student center, which is a shame. I left the tour at this point and went in myself, and it was a vibrant, welcoming facility. 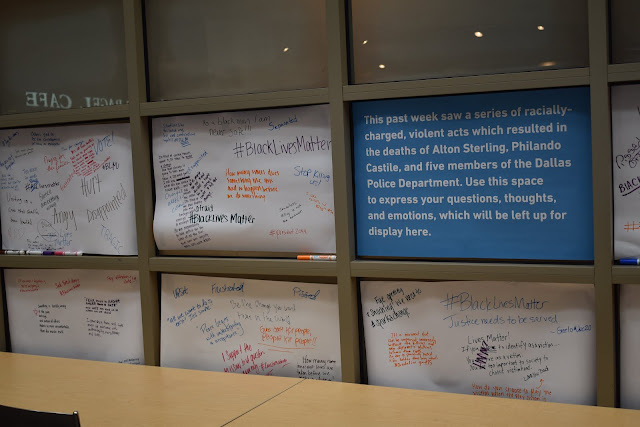 I was especially impressed with a “free-speech” display that encouraged students to write their responses to the “Black Lives Matter”/”Blue Lives Matter” controversies that convulsed the nation this summer. I really liked the effort to give every student a voice and a chance to express themselves in public in a non-volatile way. Students applying to UNC use the Common Application and should be prepared for two short (200-250 word) supplemental essays in addition to the standard Common App essay. There is an $80 application fee, and students need to arrange to send their SAT or ACT scores as well. Test scores are part of the calculations for merit aid, and UNC will “superscore” both SAT and ACT scores; in other words they will use the scores that make students look their best. As far as high school grades go, UNC says that they will “look at them, but not focus on them”. They do NOT recalculate or change the weight of grades. Their main focus is on whether or not students took the most challenging classes available to them and for an upward grade trajectory. As far as need based aid, UNC is proud that the New York Times named them one of the most economically diverse colleges in 2015. In last year’s freshman class, 19% of students were the first in their family to attend college, 33% were students of color and 14% were Covenant Scholars, meaning that their families earned less than 200% of the poverty level. So while geographic diversity is comparatively low at UNC, economic diversity may be higher than at most similar flagship state universities. This is super advice that should apply to every application essay for every college. Good job for pointing that out, UNC! The University of North Carolina at Chapel Hill boasts a beautiful campus, a great location in an economically vibrant part of the state, and excellent resources devoted to student education. The university has a refreshing emphasis on educating the residents of its state first, and making sure that their education is affordable to all North Carolinians. 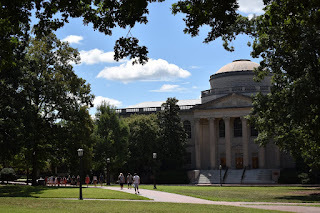 If I knew a teenager in North Carolina I wouldn’t hesitate to recommend UNC, and I would also gladly put it on the list for out of state students looking for a southern experience. 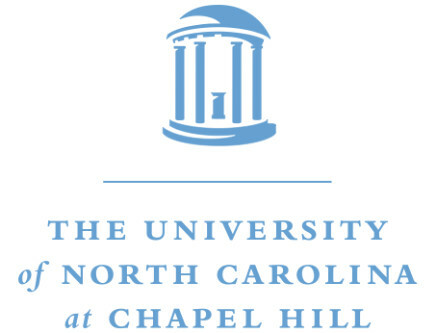 The admission office does their best to keep the University a hidden gem, but I think that if you are willing to do some of the research yourself you may find that UNC is the right place for you.